If you are looking for a comfortable backpack beach chair, with an ultra-cushy comfort and extra seat capacity, Rio Gear Big Guy Backpack Chair fits the bill; it is a heavy-duty outdoor chair with the convenience of a backpack. The next time you are relaxing at the beach, Rio Gear Big Guy Backpack Chair makes the perfect companion. The sturdy and aluminum-framed chair has extra features that promote maximum relaxation. Besides having a wide seat capacity, you do not have to worry about spilling your drinking or sitting comfortably. It has a padded headrest that makes lying or sitting down easy and comfortable. There is a drink holder that keeps your beverages chilled. This extra large beach chair has two adjustable padded straps that make it easy to fold and carry around. It has a removable headrest and can be reclined and folded into four different positions. 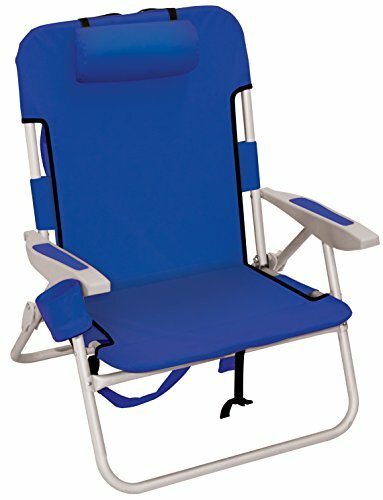 This wide beach chair also has a back storage pouch measuring 15” by 16” Inches; there is enough room to hold your towel, mobile phone, and other accessories. Made from polyester and coming in blue, it is ideal for outdoor use. It can support up to 300 lbs. of weight in full upright and reclined positions. Cool and quick-dry rugged heavyweight 600 grams of poly canvas with the convenience of a backpack. The beach chair has adjustable shoulder straps that make it convenient to carry around. The Rio Gear Big Guy backpack chair stands out from the other beach chairs because of its comfortable and roomy seat. Some beach chairs are too narrow and are not a comfortable fit for heavier people; the Rio Gear Big Guy backpack chair can accommodate persons weighing up to 300 pounds without compromising on their level of comfort. The beach chair is ideal for indoors and outdoors. It has a sturdy aluminum metal frame that can withstand outdoor weather conditions. Also, aluminum is lightweight thus making the chair easily portable. Whenever you are using the chair, there is no restriction as for how to relax. The chair can be adjusted and reclined into four different positions with a lot of ease. The instructions on folding and unpacking the chair are clear on the manual. There is no reason to worry about your drinks or storage space for your personal effects anymore. The chair has an adequate pouch at the back that makes the ideal storage space. There is also a gear rack where you can place items such as books and mobile phones. Enjoy your drink without worry; there is a drink holder that keeps the beverage chilled and reduces the risk of spillage. The beach chair, however, may not appeal to some people because of its simple design and the single color choice—it comes in royal and navy blue. It may not appeal to people who love variety and have a sense of fashion. All in all, it is a great beach chair for anyone, and its value is unmatched.